Turn outdoor dining areas into comfortable, pest-free havens. Our heavy duty screens provide shade and cut down on wind and rain. Our vinyl systems block wind and weather and allow you to control the temperature in your dining area. 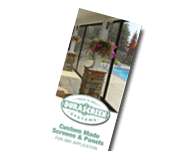 Choosing DuraScreen automatic retractable screens and vinyl panels will help keep your energy bills low, your profits high and your customers happier than ever.